The Deep South is filled with tradition---traditions carried from one generation to the next. It is a common thread which binds the past with the present - while some things change--others remain the same. Care for the resting place for those whom have gone on before us is one of those time honored traditions. I have friends who still attend "Graveyard Work Days". 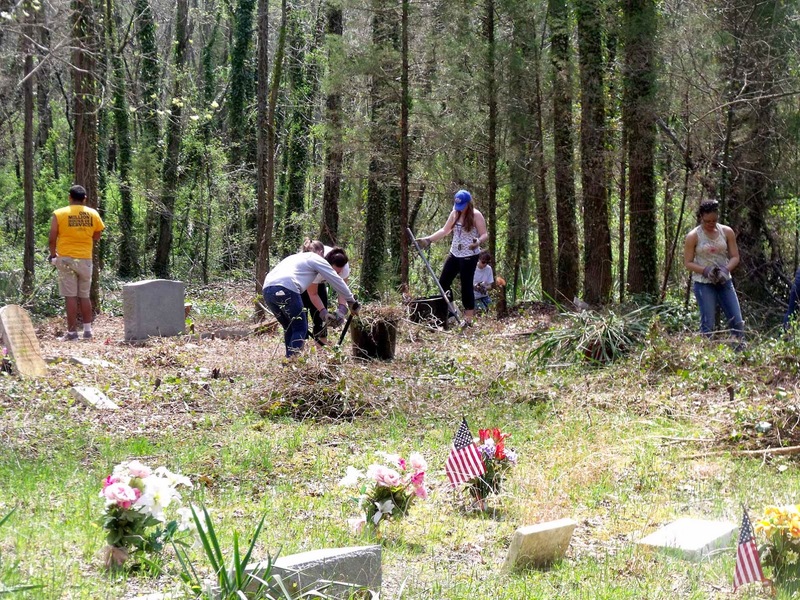 In rural churches with cemeteries in the side yard or perhaps across the road, a day is set aside every year to spruce up the final resting place of those dearly departed. Usually a day close to "Memorial Day" families and friends gather together---pull the weeds, mow the grass and place flowers to visibly honor these loved ones. Dinner on the grounds follows the tiding up for all those left behind to remember and catch up. It is a sweet tradition--filled with deep love and great fondness while wonderful memories bubble to the surface in the activity of the day. A day to show great respect for those who have gone before. There was a time when contact with those who had passed away was strictly banned. Read the Old Testament---Numbers tells us contact with a dead body resulted in being unclean for seven days. Being unclean resulted in being banned from contact with those who were clean for those seven days. The contact resulted in being ostracized from society for a week. The chore of embalming loved ones often fell to the women---since they were ostracized on a regular basis already---the sting was not so deep. Nicodemus braved it all---he came in broad daylight--carrying seventy five pounds of an embalming mixture. He anointed the body of our Savior--knowing the risk. The sure stigma of being unclean was part of the cost, but it could have cost much more--even his life. Nicodemus crept through the streets in the dark the first time he sought Jesus---a pharisee--he feared reprisal for contact with Jesus. His time with Jesus was so moving--so life changing---he publicly acknowledged who Jesus was by this final act of respect. He tended the dead body of the Master without regard for personal cost. What have I done to show my respect? There is no body---the grave is empty--He is alive. How can I serve Him with no regard for the cost? By serving "The Least Of These"---I serve Him---it is the very least I can do. "Nicodemus, who had first come to Jesus at night, came now in broad daylight carrying a mixture of myrrh and aloes, about seventy-five pounds. They took Jesus' body and, following the Jewish burial custom, wrapped it in linen with the spices. I appreciate hearing about this Southern tradition ... to honor those long past is an honorable, beautiful task, yes? True servanthood sometimes requires personal sacrifice but who are we when He sacrificed it ALL?